These words spur three reflections. First Benedict has offered elusive comments, brief statements, and now this delphic quotation, but he has not provided a much-needed major statement on this vital topic of Islam. One hopes it is in the offing. 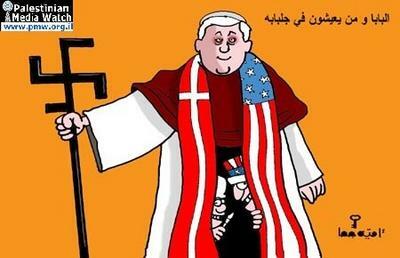 Vatican leaders tried to defuse the pope's quote, as well as his condemnation of jihad (holy war). The papal spokesman, Federico Lombardi, S.J., said Benedict did not intend to give "an interpretation of Islam as violent. ... inside Islam there are many different positions and there are many positions that are not violent." 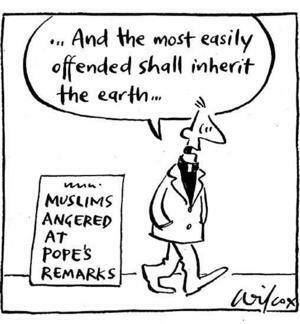 Cardinal Tarcisio Bertone, the secretary of state, indicated that the pope "sincerely regrets that certain passages of his address could have sounded offensive to the sensitivities of the Muslim faithful." 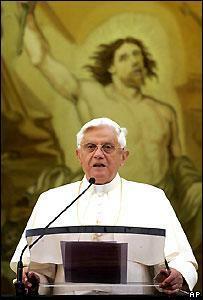 Feb. 16, 2007 update: Five months later, I note in a blog that "Pope Benedict XVI Changes His Tone."